Why Does My BMW or MINI Suspension Shake After a Snow Storm? Man, That Snow Storm Really Took A Toll On My Suspension! We often hear this after a good snow accumulation. In reality, the snow did not wear or ruin your BMW’s or MINI’s suspension. It’s likely that the wheels are filled with snow and/or ice. 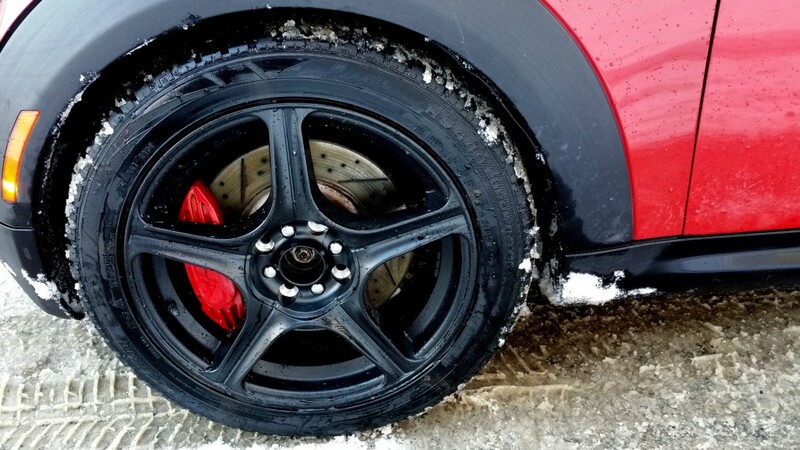 Take a look at your wheels before driving, after a snow/ice event, or after driving through a plow berm. 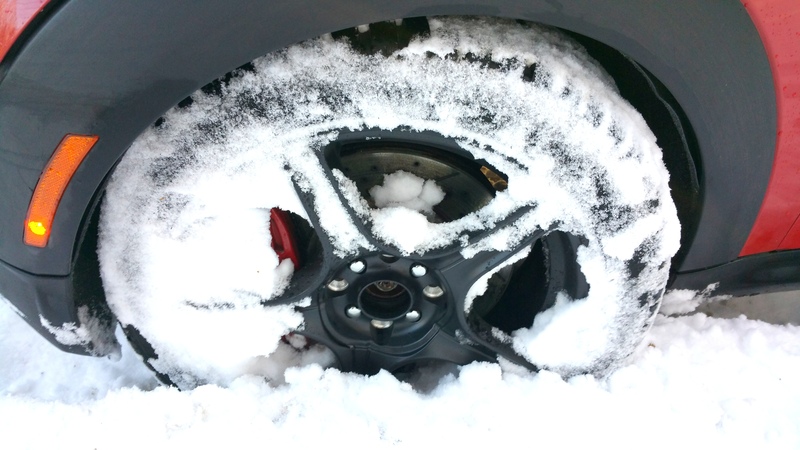 You will see that snow or ice has accumulated on the wheel’s lip and/or in-between the spokes. 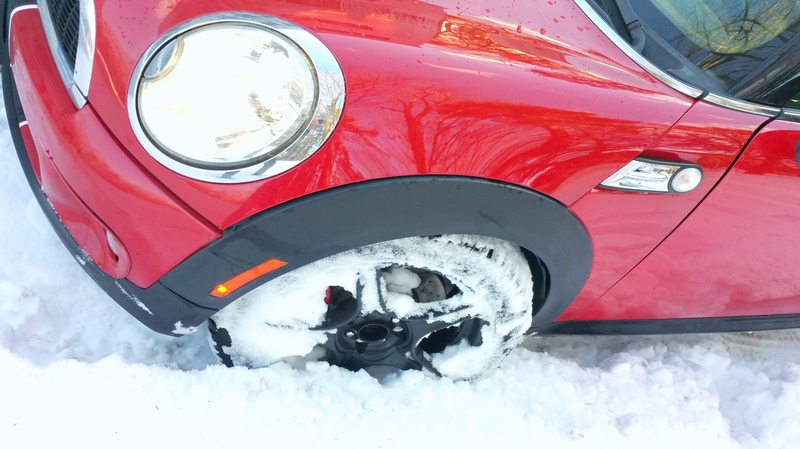 This snow/ice will cause the wheel and tire to be out of balance …. resulting in vibration and shaking as the vehicle speed goes up. We caution you to NOT continue to drive if you experience this. The vibration and shaking will result in extra wear to the suspension components (shocks, control arms, bushings, ball-joints, etc.). Clean snow and ice from the wheel edges as well as between the spokes. If vibration is noted once you get on the road, pull over at a safe location and work on cleaning out the remaining snow/ice. We have used many different tools for cleaning out the wheels. Some work moderately well, others can damage the finish on the wheels … some just don’t do well (like your windshield clearing brush/scraper). 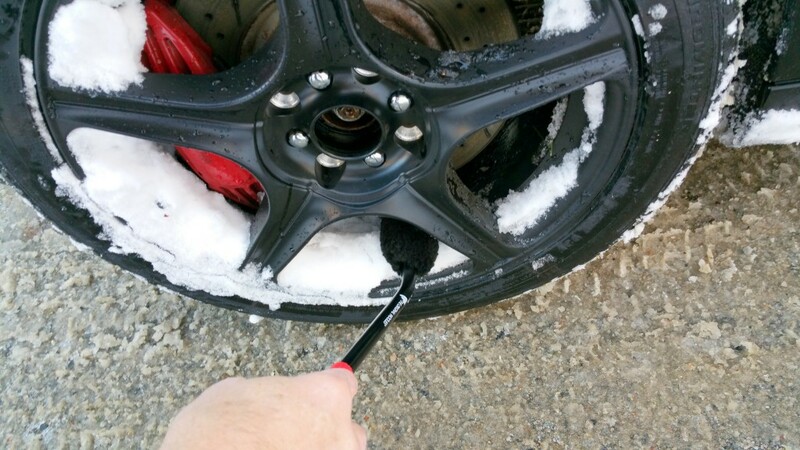 Recently, we have found a tool that is easy to store in the vehicle, easy to use, and does a perfect job of clearing the accumulated snow from both the wheel edges/lips and between the spokes. 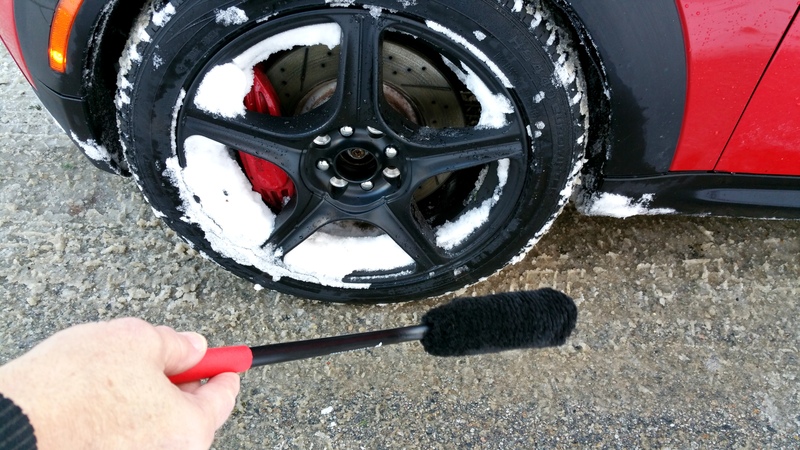 The hand-held Wheel Woolie wheel cleaning brushes, which are designed to clean wheels without scratching or splattering back at you, also do a great job of snow removal. You can find a favorite from the various brushes offered, but we generally like to use the angled handle 2.5″ x 5″ x 18″ brush. This brush has a nicely sized head and the longer, angled, handle makes cleaning from a standing (vs. kneeling) position comfortable and easy. If you have wheels with many spokes and smaller open areas, you may like one of the Wheel Woolies with a smaller brush head.